Bronzers for us very fair gals have come a looong way. I’m really happy about the updates and added shades that companies have made. Back when I first started wearing makeup about 20 years ago, bronzers seemed to all come in one shade: medium, with a hint of orange. I’d get that slightly dirty, too-dark look, which also somehow made my concealer and the center of my face look oddly pale and way too light. I always looked like I was dirty, instead of looking glowing and healthy. What I’ve learned about bronzer is that it works best if it’s only slightly darker than your skin. It really only needs to be a half a shade deeper than your skin. This will give you a glow vs. that just-rolled-in-the-mud look. I’m happy that so many companies have started making lighter versions of their best selling bronzer formulas. There are three bronzer formulas: powder, cream, and liquid. Cream and Liquid formulas are great for natural looks and dry or mature skin. Honestly, I tend to use powders more, as I like to apply bronzer last, after all the rest of my makeup is done and they are a little quicker. But I love the look and natural finish of cream and liquid bronzers. If I’m using a cream of liquid formula, I’ll apply it right after foundation and concealer and blend immediately. You can also add a drop directly into your foundation if you are tan and the foundation is a bit too light for you (good vacation makeup hack). I love how bronzer takes me from a bit too pale looking, to sun-kissed in just a few swipes. Here are my favorite fair-skin-approved bronzers! 1 | Tom Ford The Ultimate Bronzer .3 oz, $68 – Gold Dust. Holy macaroni. This bronzer is the cream-de-la-cream of bronzers. It’s light and gives a natural skin finish. It never looks like I’m wearing bronzer, no matter how much I pile on. It just looks like I’m back from a vacation. Yes, it’s expensive, but I have been using the same giant pan for over 3 years and it still looks almost new. 2 | Physician’s Formula Butter Bronzer .38 oz, $15 – Light. Physician’s Formula has the lock down on drugstore bronzers. They have every finish you could want – matte, satin, shimmer. I LOVE that they have “Light” versions, fair skin honey bunnies, you will love these. They have truly sunkissed shades, never orange. Their bronzers do skew more gold, so this is greta for warmer and neutral toned fair-skin ladies. I’ve always been happy with these bronzers and have tried several formulas. The new Butter one is their best selling product and smells like a vacation. Hot Tip: you can use your Ulta coupons on this brand. shop it | ulta . target . ebay . 3 | Bare Minerals Bareskin Sheer Sun Serum Bronzer 1 oz, $28. This liquid bronzer can feel a little tricky the first time you use it. I recommend putting a drop on the back of your hand, dipping a foundation or kabuki brush into the liquid evenly, then applying it in the traditional bronzer “3” shape (forehead, cheekbone, jaw line). I always make sure to pack this for summer vacations because it guarantees my foundation will always look right, even if I get a little sun. If I’ve gotten deeper, then I just add one drop directly to my foundation to make the foundation a shade deeper all over. It looks completely natural on, the tone is just perfect, nice and bronzing, with no orange in sight. It’s a great bronzer!! Satin (natural skin) finish. 4 | Benefit Dew The Hoola Liquid Bronzer 1oz, $28. This is a matte liquid highlighter. It’s also so light that it’s perfect for fair skin. It literally gives my skin a hint of natural brown warmth, with no orange tones. It smells incredible. I apply the same way as the Bare Minerals. Liquid bronzers are SO easy to wear and blend in flawlessly once you get the hang of application. They are a new favorite of mine. The Benefit formula is especially great because it’s a creamier liquid formula, aka: not runny, so you can put a drop on the back of your hand and work from there. 5 | no 7 Match Made Bronzer .352oz, $13 – Golden Sands. I just tried this brand for the first time this year and love this shade of their bronzer. Also, the packaging/ powder design looks like a high end brand. The bronzer is a nice matte formula. On hotter days this summer when my skin had enough natural *glisten* I would reach for this matte shade and get a nice natural looking sun kissed-without-sparkle look. It is very pigmented, so I recommend to use sparingly. 6 | Becca Cosmetics Sunlit Bronzer .25oz, $38 – Bali Sands + Capri Coast. I said it before about Becca highlighters and it’s worth repeating: They have their powder formula on LOCK. Their powders are so creamy and the formula is just incredible. This bronzer melts into my skin and looks so natural. There is just the perfect amount of glimmer for a satin skin finish. This bronzer just looks so incredibly natural and never powdery. Bali Sands is great for very fair skin and Capri Coast works for my fair-to-light skin. The Becca bronzers are giving my Tom Ford bronzer a run for it’s money. 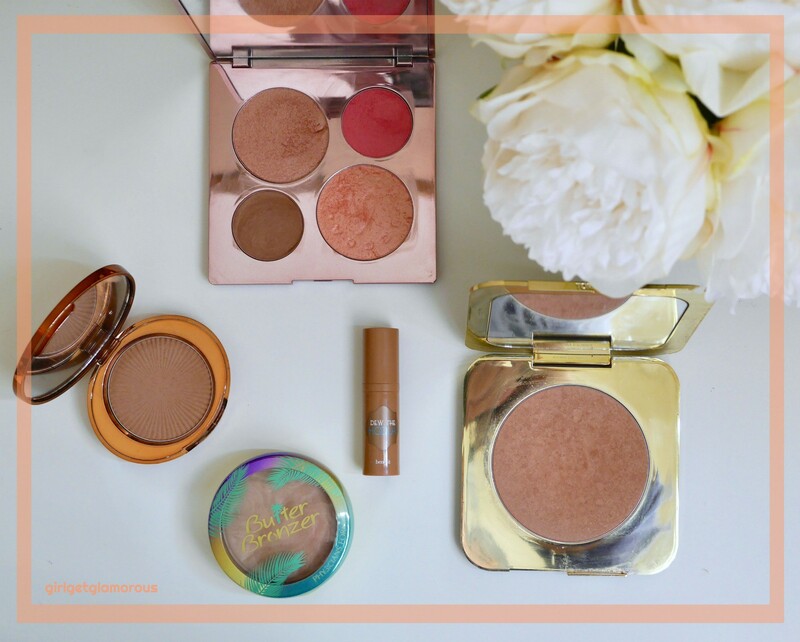 These are amazing bronzers! Also, the Chrissy Teigen x Becca palette is limited edition, but also has an amazing bronzer in it, as well as the prettiest highlighters and blush. It has been my go-to palette for the past few months. Grab while you can! $7 Foundation – Yay or Nay? I hope this post was helpful! Please let me know if you try and of these bronzers or if you have a great fair shade bronzer leave me a comment below – I’d love to know your favorites! Drugstore Makeup That Will Rock Your World. Julep Plie Wand: What The What? Cyber Monday 2014 – I Know.